In recent years, flooding has been given a new meaning for many Manitobans. The Assiniboine River experienced a 1-in-350-year flood in 2011 and numerous flooding events over the last three years. What has shaken entire communities, destroyed infrastructure, is now at the forefront in provincial politics. Is it a changing climate? A few wet years? While there is doubt on the cause, flood severity is now being linked to the decline of wetlands in our prairie pothole region. In Canada, this region includes southwestern Manitoba, southern Saskatchewan, and southeastern Alberta. It is designated as being the primary agricultural region of both Canada and the United States. A wetland is a depression in the landscape where the water table meets the soil surface. It discharges water from underground while also capturing and retaining overland flow from adjacent fields. Wetlands can be either permanent or temporary and are surrounded by water-loving vegetation. Wetlands create pockets in croplands, which hinder cultivation. Economic drivers, such as increased grain prices and fuel costs have forced farmers to drain large portions of wetlands over the past 50 years. Intricate drainage systems now facilitate water movement off farm fields. Farming is a business, and a crop that cannot be sown is a crop that cannot be reaped. Recent work by Ducks Unlimited Canada demonstrates the ecological services that wetlands provide. Diminishing wetlands can accelerate the delivery of water and nutrients to surrounding lakes. Wetlands act as buffer zones that sequester excess nutrients, but if the nutrients make their way to water bodies, such as Lake Winnipeg, the resulting algal blooms may be devastating to the commercial fishing industry. Programs and incentives to encourage farmers to leave wetlands intact are important for downstream water quality. But what about the contribution from our cities? The City of Winnipeg contributes 14 per cent of the total phosphorus loading to Lake Winnipeg and 24 per cent to the Red River. One innovative solution is the construction of naturalized storm water retention ponds, which are urban mimics of naturally occurring prairie potholes. Native Plant Solutions (NPS), a business line of Ducks Unlimited Canada, specializes in wetland construction and native prairie installations. To the untrained eye, they are just that. In reality, these ponds are multi-functional, complex ecosystems right in our backyards. 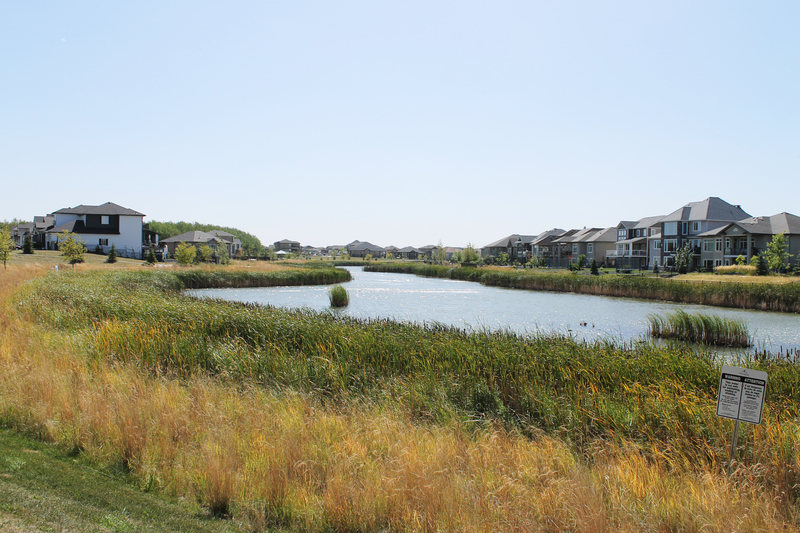 Duck ponds feature an open water body surrounded by a stratified plant community consisting of submerged wetland plants, wet meadow plants, and an upland native tall grass prairie. Each feature is installed and maintained under the sharp eye of a team of wetland biologists, plant ecologists, and agronomists. The general purpose of a storm water retention pond is to ease stress on sewer systems. A conventional storm water pond has a constant depth, gravel around the perimeter and sod uplands. Alternatively, naturalized storm water ponds are built using sound science to support wetland plant communities. Special attention is given to the relationship between hydrology and plant ecology. For example, in ideal conditions cattails need half a metre of water. So, when ponds are constructed, different levels are created to support plant growth. Emphasis on pond morphology and plant community is important, and we know from the prairie pothole region that wetlands provide important water filtration. In a study comparing conventional ponds to an NPS designed naturalized pond, algal communities were 18 times higher in the conventional ponds. In addition, of the algal communities present, blue-green algae were 2,200 times higher in the conventional ponds. So not only was there significantly more algae in the conventional ponds, but also the problematic kind of algae. The exciting part is that both ponds were in their first years, meaning the vegetation in the naturalized pond had only just begun to establish itself. Naturalized storm water retention ponds are a relatively new service, having only been provided for the last 10 years by NPS. This innovative model, mimicking our regional prairie pothole ecosystems, puts Winnipeg on the map for improving the sustainability of our residential communities, and will hopefully provide a template for communities across Canada.